Pax stepped back and crossed his arms, studying her. She perched like a butterfly on the edge of the console - light and fragile, trembling softly. Light, yes. Fragile, no. He had a stinging ache in his side to remind him of that. The animal in Pax was awake and busy - lighting up nerve fibers, readying his muscles. His mate was walking away from him, and a living wall stood between them. He growled with impatience, at the others and at himself. "I'm never letting you out of this room," he rasped in her ear. "There's nowhere else I want to be." Sharon Lynn Fisher's second novel, The Ophelia Prophecy, is a highly entertaining, action-packed, escapist science fiction romance, full of thrills, twisty surprises and tension. It might not be the most polished sci-fi pearl out there, but it certainly delivers everything a good sci fi book should: solid action, unique creatures, some really interesting ideas, captivating, well-thought-out plot line and lots and lots of excitement. Plus, it's hot. Seriously, mind-blowingly hot. The story follows the extraordinary adventures of Pax and Asha, as they find themselves at the center of the conflict between humans and Manti, a race of hybrid half-insect warriors. Asha is a human girl who works as an archivist documenting and analyzing information about the Manti. The story kicks off with her being captured and taken into captivity by Pax and his sister, Iris. Pax and Iris are both Manti, and not just any Manti, but amir's children (which basically makes them the prince and the princess of the Manti people). With no memory of how she ended up on the beach outside her hometown and safe zone, Asha has to try her best to figure out what happened prior to her encounter with the Manti siblings and find a way to escape her captors. And considering Pax's unexpected and nearly uncontrollable passion (or horniness, if you will) for her, the task might prove very hard, if not impossible. And the things she'll learn in the process - about her family, her hometown and herself - will change her life forever. 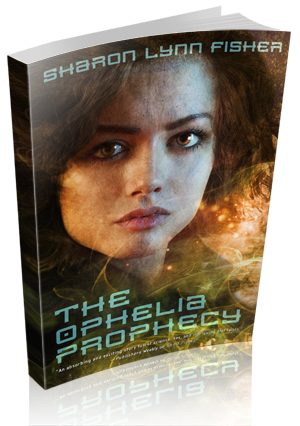 Told in alternating voices of Asha and Pax, The Ophelia Prophecy is a highly addictive story. Gripping, fresh, steamy and very entertaining, it's a real page turnener of a book. Personally, I enjoyed it way more than I ever thought I would. This was my very first science fiction romance and I won't lie, I was a bit skeptical at first. I wasn't sure if this will prove to be something I'll connect with, or something I'll have to suffer through. Thankfully, from the moment Pax and Asha exchanged their first words, I knew I was in for a treat. And I was right. The Ophelia Prophecy proved to be one helluva entertaining ride for me. I breezed through the entire thing in no time and am now counting days to the release of the second book. The book is literally overflowing with sexual tension and amazing chemistry between the characters. The world-building and unique mythology created by the author are truly epic. Sharon Lynn Fisher presents us with a broad palette of interesting characters and vividly described settings, through which she paints a fascinating, fully realized world. It's an intriguing sci fi vision and a hot romance, but don't think that's all it is. It is so much more than just that. It's quite a clever and multi-layered exploration of what makes us human. It's a complex political intrigue. It's a tale of love and trust, passion and betrayal, unexpected alliances and fighting for what is right - even if it means going against your own family, race and everything you believed in. If you enjoy a good romance story set against an exotic background and filled with interesting characters, settings and ideas, The Ophelia Prophecy is the book for you. The science fiction part is complex enough to satisfy all fans of sci fi flicks, but not heavy enough to weigh down the plot line. The action races along at a near break-neck speed, the romance is deliciously spine-tingling and the conclusion of the first book, while perfectly satisfying, leaves you craving more. More of Pax and Asha. More of their intriguing universe. More of the gasp-worthy secrets and evil plottings of their enemies. More, more, more! I really can't wait to find out what happens next! I write books for the geeky at heart -- sci-fi flavored stories full of adventure and romance. 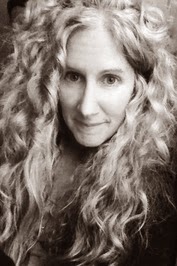 I have a passion for world-building and twisty plots, and themes that recur in my writing include what it means to be human and symbiosis in human relationships. - Awards: RWA RITA finalist, 3-time RWA Golden Heart finalist. - Labels: Aries. INFJ. Geek Mom. - Hobbies: Mountain bike, climb, hike, and breathe in the beautiful Pacific Northwest. - Vices: Battle writerly angst with baked goods, Irish tea, champagne, and craft beers. - Favorite color: Green. Blue. Pink. Yellow. Teal. Aw hell. - First accomplishment as a writer: Honorable mention for "Ice Age Adventure" from Cricket.